That’s a hard thing to explain to someone who isn’t hooked on this sport. I love summer. The warmth and color, the bike rides and hikes, the long days of light, the sandy beaches, the crisp vegetables picked fresh from the backyard garden. But sometimes, even on those long, hot, lovely days, I dream of skiing. Of gliding in perfect, arcing turns through snow. It is, perhaps, the closest thing to flying I’ll ever feel. Freedom. Power. Grace. Ski you in my dreams, powder. Normally by this point, mid-way through April, I am good and ready to say so long to winter. This year, though, I am having a hard time letting winter – at least the skiing part of winter – go. It feels like a reluctant farewell to a loved one, where you ache for one more hug before the last good-bye. No matter how many runs I take, I want just one more perfect one, because I don’t know when the next one will come. This winter was one of ups and downs – early snow, mid-season rain and ice, deep February powder days followed by another thaw, and another brief deep freeze in March. These April days are like a bonus to a ski season that fluctuated throughout, from one extreme to the next and back again. The first Sunday of April, on our first weekend day off from coaching (me) and race training (kids), we went out for a few family runs and ended up skiing until after the lifts stopped running, exploring glades we’d never skied and spending a near-perfect afternoon with friends. Our last run was on an old trail through the woods, cut some 80 years ago by a Civilian Conservation Corps crew. This trail branches off from the main ski area after a short hike, then winds its way down through an old forest, past rocky outcroppings, to the end of a dirt road a few miles from the base of the ski area. The day ranks among my most favorite ski days ever. Maybe, I thought, it would be our last of the season. But, greedily, I hoped for more. Last Sunday dawned sunny and warm again, after a snow-squalling Saturday, and we went out for a few more runs. Soft, sloughy, sunny runs. More exploration of new places. More turns down old favorites. I could have stayed all day. Alas, springtime chores called us home, where the kids swiftly traded long johns and ski boots for shorts and sneakers and ditched their skis for bikes and soccer balls. My children seem unaffected by the late-season ski fever that has enveloped me these April days. They are mostly indifferent about the prospect of more skiing so late in the season. They are happy for the warmth, for the first signs of greening grass, for the freedom of running outside unencumbered by extra layers. In many ways, I’m happy for spring’s arrival, too. I love that there’s light in the sky when I wake early in the mornings, and that it lingers past dinner time. It was nice, during the warm spell early this week, to open the windows to that new-spring scent of fresh air floating indoors. I gladly notice new birdsong nearly every day as the warm-weather, feathered residents return gradually, following the snowmelt. The blooming of the first crocuses thrilled me as it has every spring since I was a little girl. Still, I’m reluctant to bid a firm adieu to winter. And so I snuck away from the desk Monday morning for a few more spring skiing runs. The combination of warm sun on my face and soft snow beneath my skis was blissful. I wanted it to last, just a little longer. 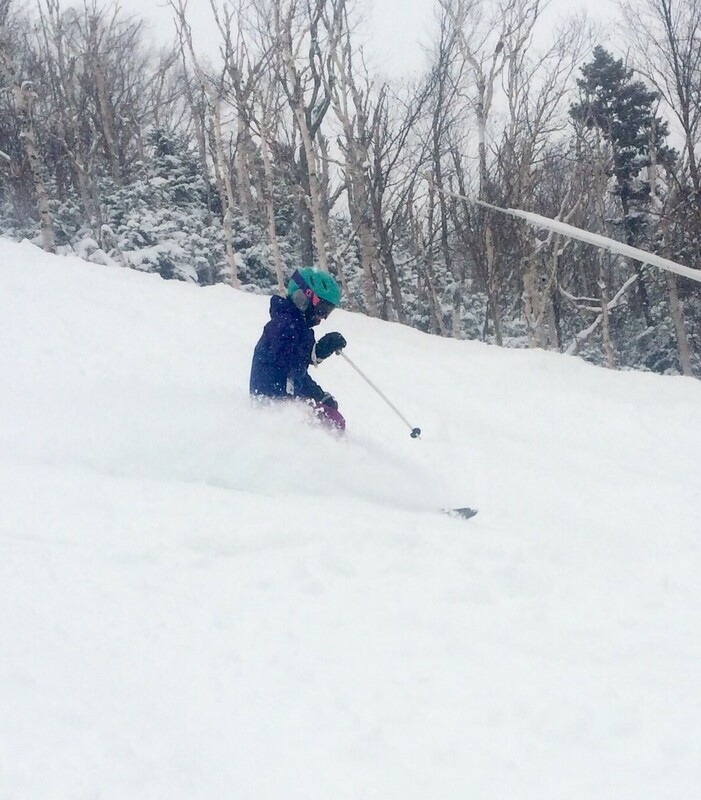 Maybe we’ll get in one more day of skiing this weekend. If we do, I imagine it will be just enough to keep me longing for more – fodder for those summer days to come, when dreams of skiing sneak in past the warmth and color, and I am floating through cool white again. Original content by Meghan McCarthy McPhaul, posted to her blog, Writings From a Full Life. This essay also appears as Meghan's Close to Home column in the April 14, 2017 issue of the Littleton Record.